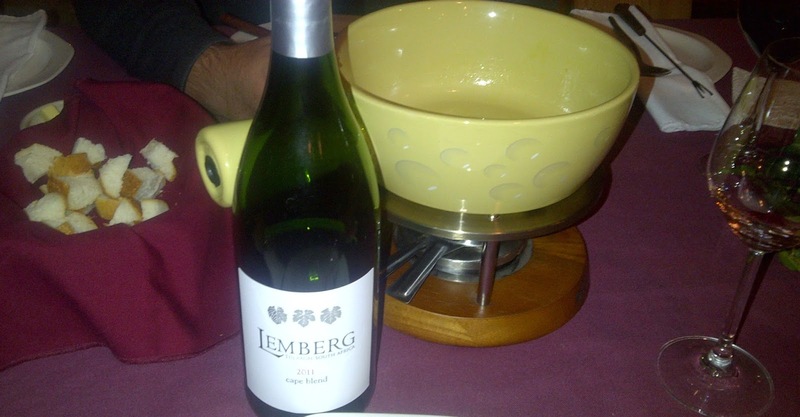 Today we visited Lemberg to do a wine tasting and try their cheese fondue for lunch. Yet again we had a lovely experience. They have a comfortable lounge area to enjoy a wine tasting, while staying warm beside the fireplace!! Lemberg is one of my favourite wine estates due to their good quality and delicious wine at affordable prices. The winemaker, David Sadie, is a very modest, friendly, welcoming and humble person. He is usually the one at the tasting room to provide guests with informative tastings. I highly recommend visiting this wine estate in Tulbagh. Other favourites in Tulbagh include Saronsberg, De Heuvel and Waverley Hills. 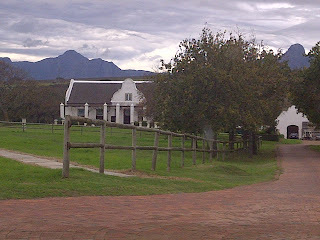 Spend the weekend in Tulbagh, it is such a beautiful place and there is plenty to see and do!! 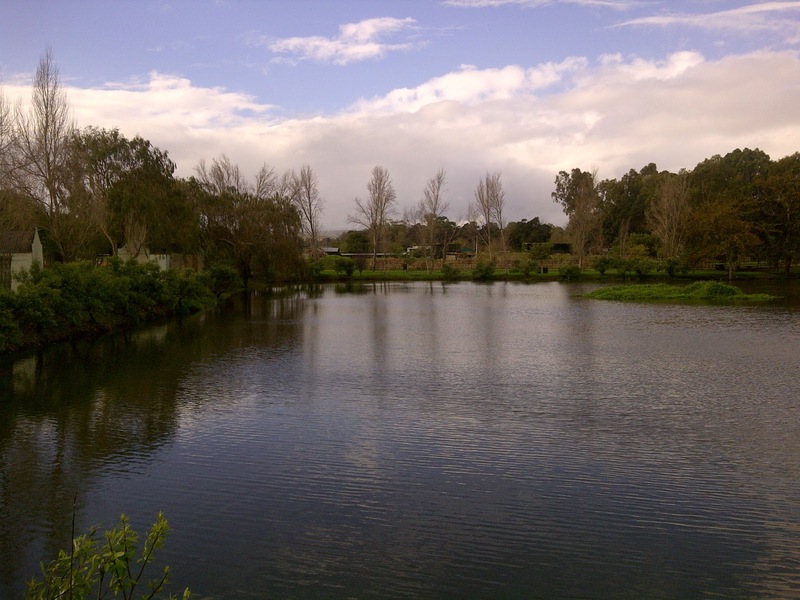 Tulbagh Christmas in Winter is a fantastic weekend to choose to spend in Tulbagh, I highly recommend planning a trip to Tulbagh around this festival!! My favourite wine of Lemberg's is the Lady Lemberg at R120 a bottle. It is a blend of 57% Viognier, 22% Harslevelu, 11% Sauvignon Blanc and 10% Semillon. It has lovely flavour, a soft yet full mouth feeling and nice body. I am also a fan of their Syrah, Pinotage, and Surin (dessert wine). Lemberg wine is delicious (soft tannin and fruit driven wine) and I highly recommend you visit their estate to stock up on their wine!! This wine estate was on our way in to Tulbagh from where we were staying at Reflections and we hadn't heard of it before so decided to check it out. 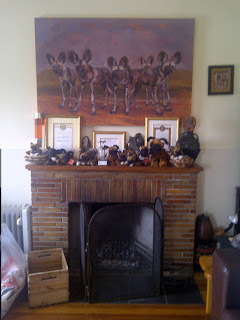 We were greeted by the owner and shown through to the back where we could sit outside. Yes it was winter but it would have been a sin to sit inside on such a beautiful day!! 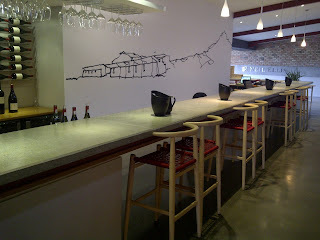 A tasting is R25 per person and waived on purchases of wine. However, if you go for the Christmas in Winter festival (which I highly recommend) then you pay a once off fee, get a glass and can taste wine at all the participating estates. Even though the winemaker was around, the owner did the tasting with us, which I thought was a bit strange, especially as he wasn't able to give us a very informative tasting... Anyhow, the tasting was pleasant as we were able to try some wines we hadn't tasted before, enjoy the views and after the tasting we enjoyed a pleasant walk on the estate. It is a beautiful place and I think it would be a lovely place to get married. 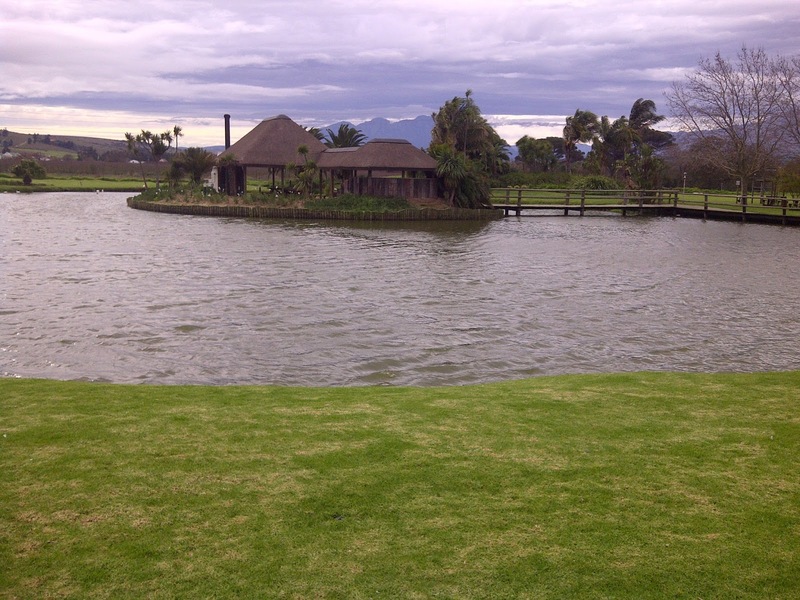 They have a chapel on the estate, a function room, a restaurant and lovely gardens. What more could you want? Oh and there is accommodation on the estate!! 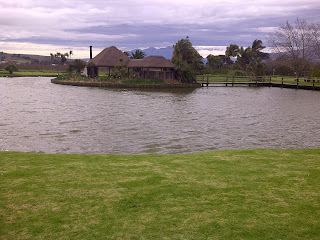 It really is an ideal place for a wedding!! Semillon 60% and Sauvignon Blanc 40% 2010 at R65 a bottle was very fresh, crisp, not too acidic, rounded, light, medium bodied, slight lemon hints. It was very nice. Thatch House Red (Shiraz, Merlot, Cabernet Sauvignon blend) 2009 at R50 a bottle was light, smooth, with some dark berry flavours coming through. It was nice. Pinotage 2011 (R85 a bottle) was fruity, had nice berry flavours, was smooth and pleasant. Was nice. 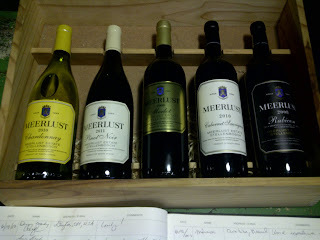 Merlot 2010 (R85 a bottle) was also smooth, fruity, little spicy, powdery tannins. Was nice. Shiraz 2010 (R85 a bottle) was fruity, smooth, a little spicy and pleasant. I liked this wine. Cabernet Sauvignon 2010 (R85 a bottle) had nice cherry aroma, soft and pleasant. Was nice. Overall we enjoyed our experience here. I would recommend this place if you are in Tulbagh. Be sure to take a stroll on the property if you come here, it is beautiful!! 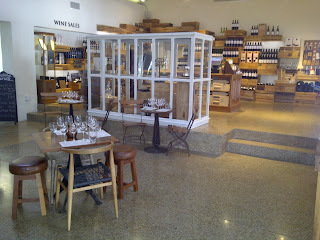 Lovely location, with a modern building, I had a nice wine tasting experience here. 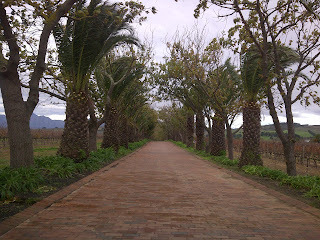 This wine estate is in Stellenbosch and on a road with many wine estates worthwhile visiting!! 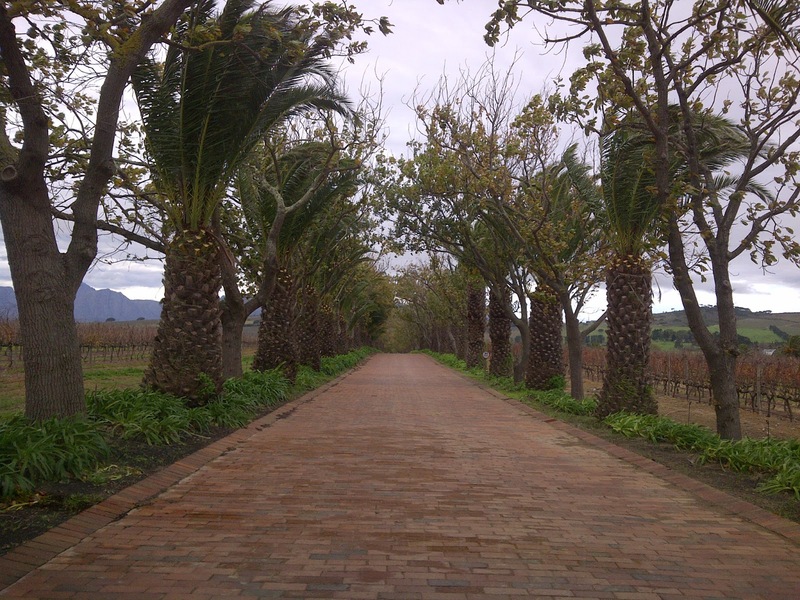 If you visit Neil Ellis be sure to visit Tokara and Delaire while out this way, that will make for an awesome one day or half day wine tour!! 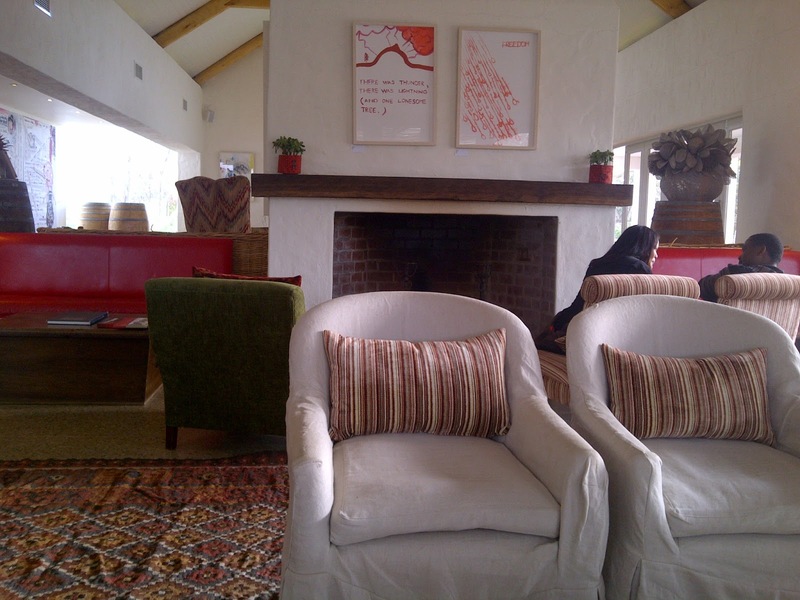 To do a wine tasting here costs R25 for a Premium Range Tasting and R35 for a Vineyard Selection Range tasting. 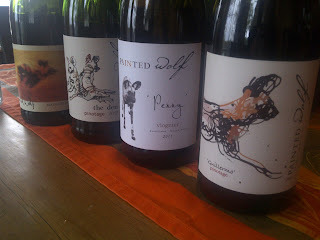 I found the Vineyard Selection more serious drinking wines and felt they could benefit from some aging. The ladies in the tasting room were very pleasant and polite. The lady serving me was struggling to remember the facts on the wine, but perhaps it was just one of those days. The service was good nonetheless. I did a complete tasting of both ranges. It was good to understand the difference between the two ranges. I also enjoyed a fabulous cheese platter while here. These platters are very good value and delicious. 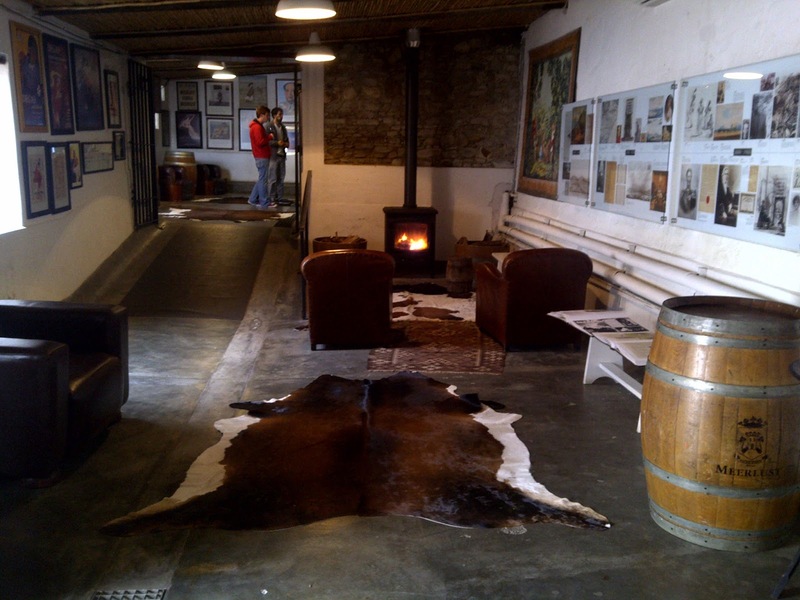 The tasting room has a fireplace so if the weather is not so great you can enjoy your wine tasting in warmth. Having said that, the tasting room is quite big and as you can see doesn't really have that personal touch and looks like it is designed for the masses. If you don't come here in a group then you may like to do your tasting at the bar like I did. 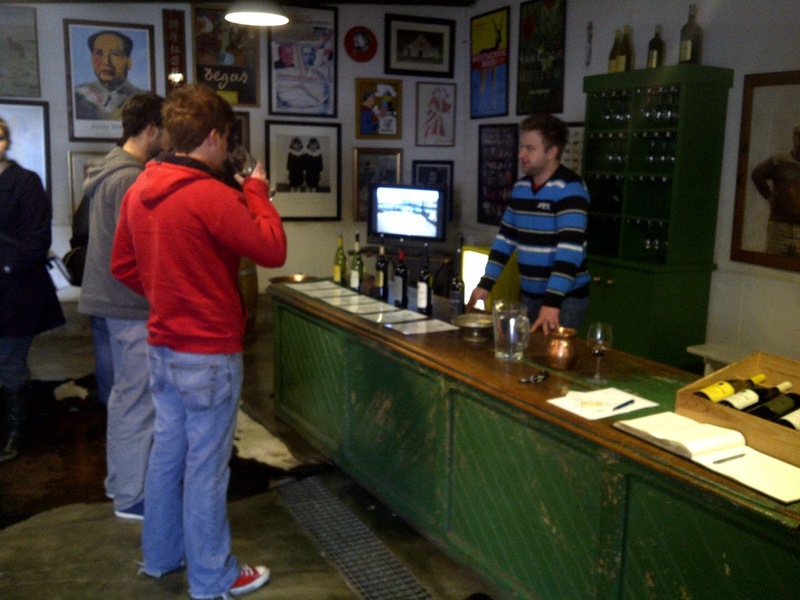 You then get more of a personal wine tasting as you are closer to the assistants and therefore they spend a bit more time with you and are more available if you feel like asking questions about the wine. 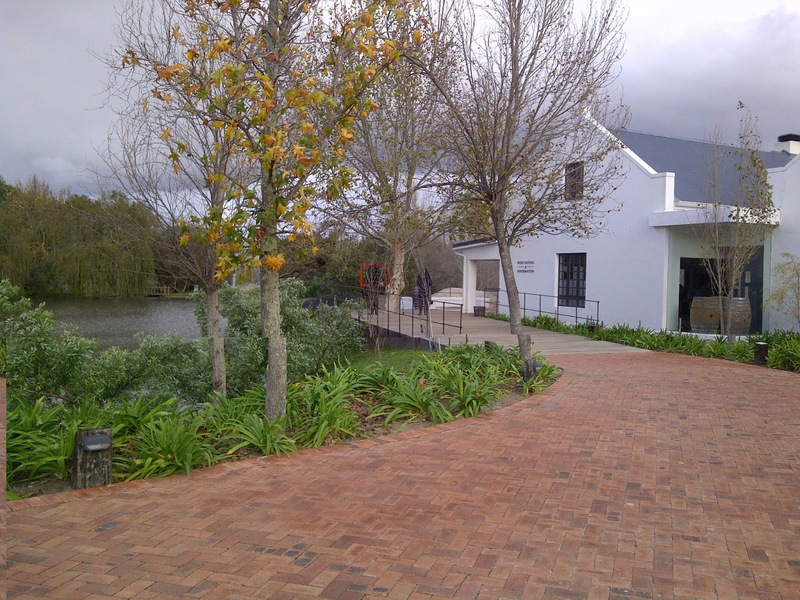 I do recommend visiting this estate if you are looking for good quality wine and an awesome cheese platter. Neil Ellis Vineyard Selection SB 2010 R125 More green tones than the premium SB. Asparagus. French oak and stainless steel tanks used. Neil Ellis Vineyards Selection Grenache 2010 - limited. R275. Prominant cherry on the nose. Stem taste with dark berry flavours. Light - medium body. Slightly tart on the palate. Lovely lingering cherry aftertaste. Nice! 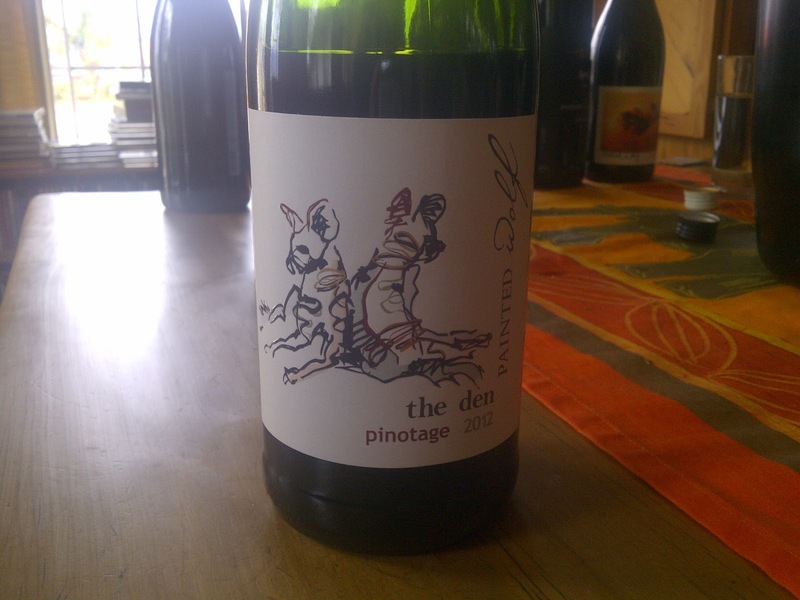 Neil Ellis Vineyard Selection Pinotage 2010 R220. Gorgeous nose, light - medium body. Little dry. Tannins were a bit much for me. Slight sweet notes on the palate. Little sour. 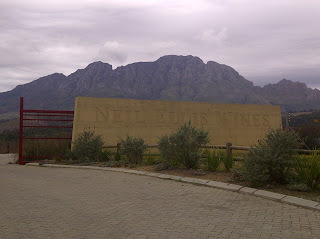 Neil Ellis Vineyard Selection Syrah 2010 R220. Smooth, light - medium body, cherry flavour. Lovely finish. Dark berry tones. Like!! Neil Ellis Vineyard Selection Cabernet Sauvignon 2009 R220. More serious tasting than the premium Cabernet. Dark berry flavours. Little dry. Neil Ellis Groenekloof Sauvignon Blanc 2012 R75. Light green, apple, lemon, fig, guava. Nicely balanced with intense fruit flavours. Smooth. Crisp, citrus finish, lingering aftertaste. Balanced acidity with fruitiness. Neil Ellis Stellenbosch Chardonnay 2012 R90. Soft vanilla nose, little floral. Smooth (could be smoother), light chardonnay. Slight apple and pear taste. Lime finish with minerality. Neil Ellis Aenigma 2012 (White Blend) R65. Blend of Viognier and Chenin Blanc. Interesting lime zest finish (sour). Apple taste. Medium body, smooth, sweet yet sour, acidic tones balance with round mouth feel. Like. Neil Ellis NLH 2011 - limited. R125. Nice light cloudy honey nose, light on palate, not too sweet. Nice. Neil Ellis Shiraz 2010. R90. Light - medium body. A little spicy, fruity, smooth. Nicely balanced. Lingering spicy yet smooth finish. Neil Ellis Pinotage 2009 R90. Tobacco box nose, fruity, dark cherry flavour, lingering finish. Light - medium body. Like. Neil Ellis Cabernet Sauvignon 2009. R125. Green nose with capsicum aroma. Little dry but very fruity. Intense flavour!! Love this wine!! Neil Ellis Aenigma 2011 (Red Blend) R65. Blend of Shiraz and Cab Sauv. I didn't like this wine. It was a little dry and sour/tart. Nose and palate not balanced. A little spicy. Neil Ellis Aenigma 2011. R65. 100% Chardonnay Muscat. Toasty/oaky nose, smooth, round mouth feel. Medium bodied. Very nice, little creamy. Liked!! 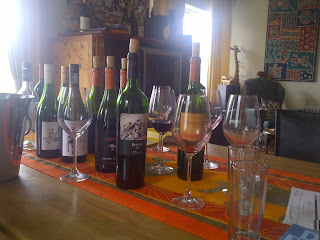 My favourites were the Vineyard Selection Grenache and Syrah. The Premium Range SB, Aenigma (white) and the Cabernet Sauvignon. Lots of wine brands are on offer here under one roof. Great service, informative tasting and a nice experience. They have a restaurant also. I have been driving past this estate everyday for the past 8 months on my way to and from work. Today I had a day off so I decided to pop in for a tasting. I had no idea that Welmoed/Stellenbosch Vineyards have many different brands under one roof and that there is so much to taste. For those of you who have been following my blog, you will have noticed I struggle to choose when there is such an extensive list!! The service here was very good. The person who served me was Cobus. He was very friendly, informative and made me feel very welcome here. They have heaps of wines to try and from several different brands: Credo, Welmoed, Kumkani, Arniston Bay, and Versus. With such a selection, it makes it very hard to decide what to taste. If I remember correctly a tasting is free here and you can pretty much taste as much as you like. 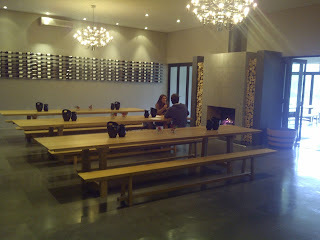 They have a big tasting room, a nice fireplace and they have a restaurant also. 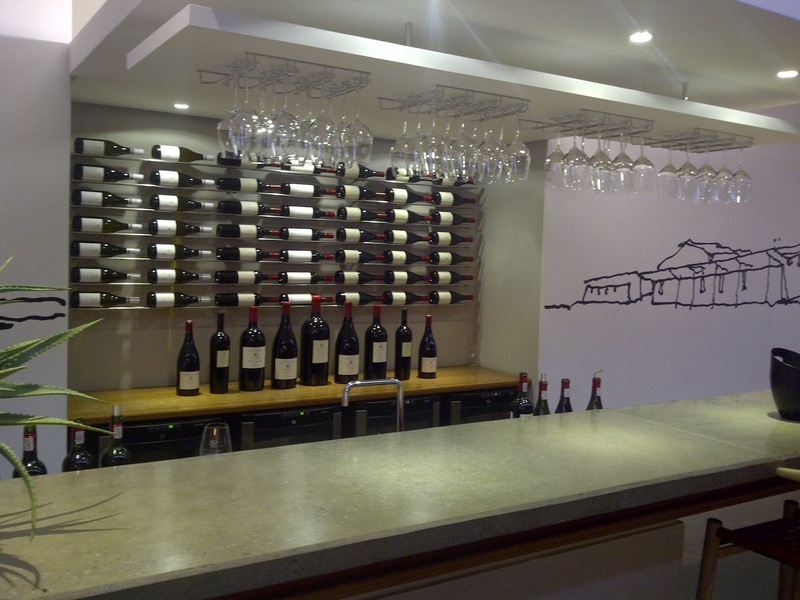 The wine is very reasonably priced, from as low as R25 a bottle for the Versus and Arniston Bay wine to R145 a bottle for the Credo Shiraz. I recommend visiting this estate if you are out this way. It was a good experience I had here. 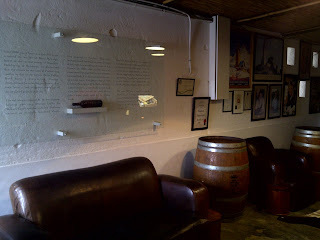 Out of all the wine I tasted, the Credo wines were my favourite. Credo Chenin Blanc 2010 (R100 a bottle) Spent 28 months in French oak, of which 80% was in new oak barrels. 14.5% alcohol. Wow, I really liked this wine. It was fruity, yet had butterscotch flavours. It was smooth, round, medium – full bodied. I liked this wine and bought a bottle. Credo Chardonnay 2012 (R100 a bottle). 8 months in barrels. Interesting on the nose, hints of ginger and pear. It had an interesting taste also. I think it’s more a food wine. Has all the flavours of buttered toast, citrus, treacle, toffee, melon and a hint of ginger as described in the tasting notes. It is smooth on the palate and unique. I liked this wine and bought a bottle. Credo Shiraz 2010 (R145 a bottle) is fruity on the nose, has dark fruit flavours, grippy tannins, bold, med-heavy body wine. It was nice. Credo Shiraz, Merlot, Viognier 2010 (R100 a bottle). Has dark fruity flavours, is a little dry, medium body, serious red wine, slight tobacco on the nose. This wine is smooth and rounded. Little spicy on the palate with a spicy finish. Welmoed Sauvignon Blanc 2013 (R38 a bottle) has an awesome pungent tropical fruity nose, very fresh, fantastic flavour, smooth, not too acidic. I liked this wine – purchased a bottle. Welmoed Viognier 2012 (R38 a bottle) was fresh, crisp, slight peach aroma, slight acidity on nose and palate. I liked this wine. Welmoed Shiraz 2011 (R38 a bottle) has dark chocolate and berry aromas, hints of ripe berries, fruity, soft, not spicy, light wine. Matured in steel tanks with staves. Welmoed Cabernet Sauvignon 2012 (R38 a bottle) was a little green, little dry, was ok.
Welmoed Red 2008 (R48 a bottle) was a blend of Cab Sauv, Merlot, Petit Verdot, Cab Franc and I didn’t like it. It was a little dry, light – medium bodied, the flavours were not right/not balanced, slight tones of dried apricots. I didn’t like this one. Kumkani Single Vineyard Range Cradle Hill Cabernet Sauvignon (R89 a bottle) spent 22 months in French oak, I could smell pine needles on the nose, was a little dry, ok.
From the Arniston Bay range I tried the Sauvignon Blanc 2012 (R35 a bottle) which I didn’t like. I thought it was a little fizzy, fresh and crisp. They will have a MCC from August at only R79 a bottle. I think it will be worth while going back to try that. 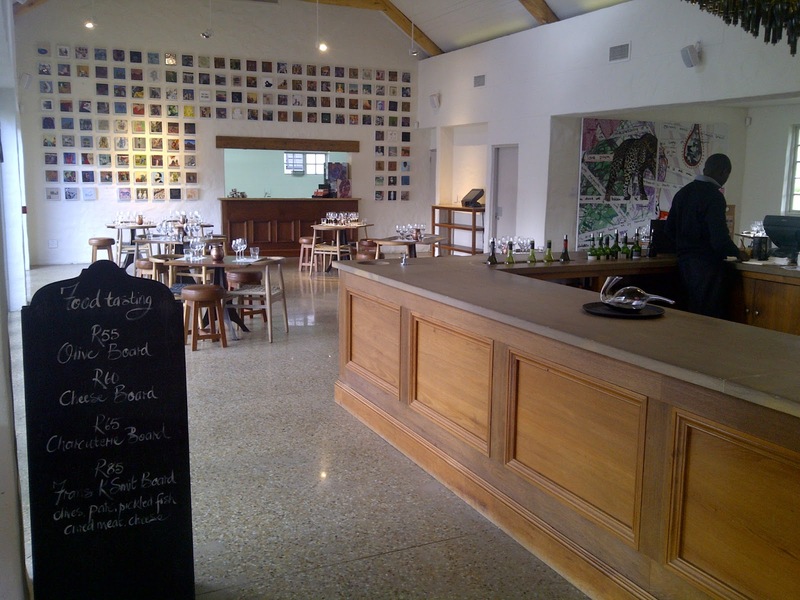 Spacious tasting room, plenty to do on the estate and a great range of good quality wine. 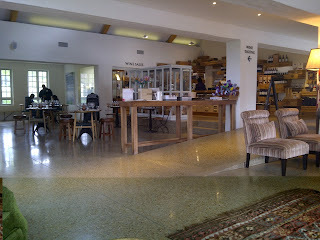 Today I went to Spier for a wine tasting with Anthony who is one of the winemakers. He assists in making the white wine. 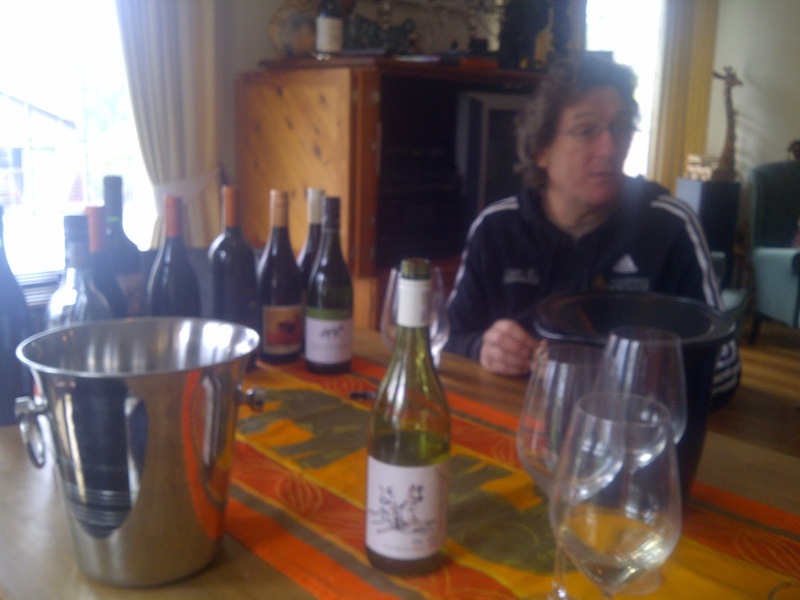 It turns out there are different winemakers for the white wine and the red wine. 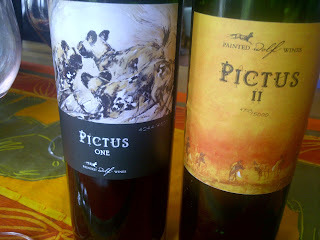 Quite clever to have the winemakers focus on one or the other, rather than both. 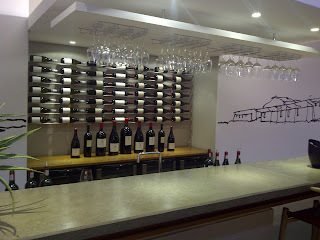 It was my first time visiting the Spier Wine Tasting Centre and I couldn't get over how spacious the room was and how nicely they present their wine. 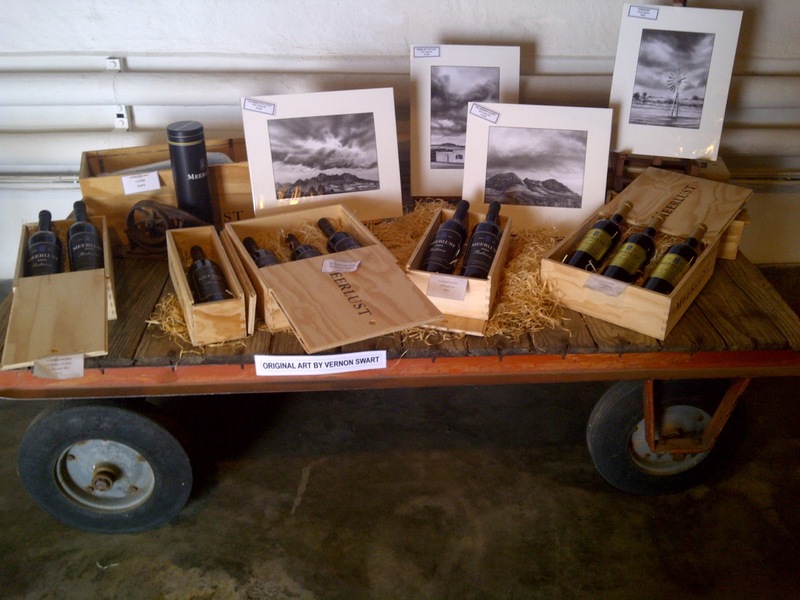 1) Frans K. Smit tasting at R90 pp. This includes a tasting of their top-tier, award-winning wines. 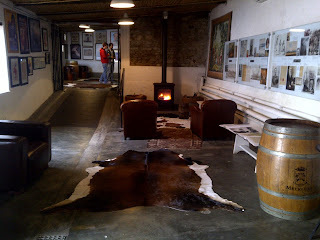 2) Heritage tasting at R60 pp. This is a food and wine pairing. 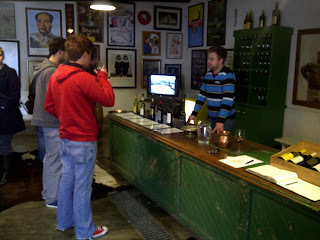 3) Spier tasting at R35 pp. This includes a tasting of three wines from the Spier range, 1 from the Creative Block range and 1 from the 21 Gables range. They also have olive boards at R55, cheese boards at R60, cured meat board at R65 and a Frans K. Smit board at R85. They truly have something for everyone here. We started the tasting with the Sauvignon Blanc 2012 (R47) which was rounded, grassy, had slight pepper/capsicum notes. It had a fresh tart/sharp finish. 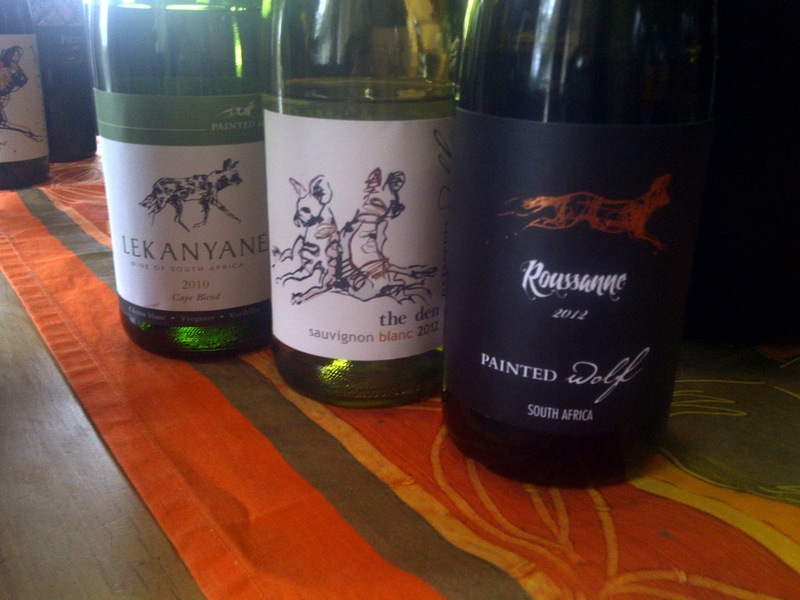 The Chenin Blanc (R38) was smooth, fresh, easy drinking and pleasant. The Chardonnay 2012 (R47) was buttery, smooth, light and pleasant. Creative Block 2 (R85) is 89% Sauvignon Blanc and 11% Semillon. It was fresh, had citrus tones, nice body, fine by itself but would probably go great with food. 21 Gables Chenin Blanc (R118) spent 14 months in french oak, the grapes are from bush vines from Durbanville. This wine had good citrus and fresh acidic tones. The Creative Block 3 2010 (R115) is 80% Shiraz, 17% Mouvedre, and 3% Viognier. It had a nice deep fruity/berry flavour, smooth, easy drinking, light on the palate, and strong on the nose. Creative Block 8 2010 had an awesome nose! I loved the taste also. It was very fruity but a little dry. 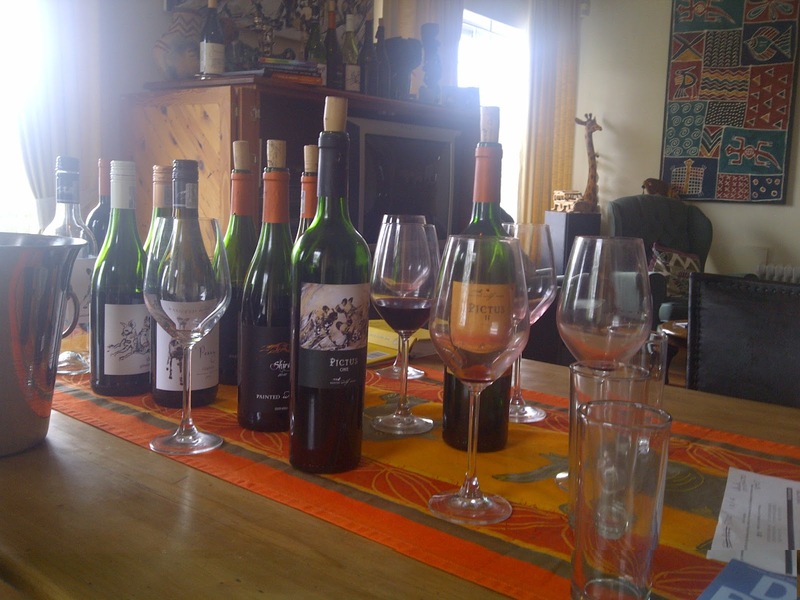 It is a blend of 8 varietals which included Pinoatge, Cab Sauv, Shiraz, Merlot, Malbec, Mouvedre, Barbera and Viognier. It is a fair trade wine. This wine was made for the Chinese market. 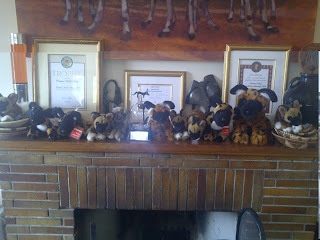 There is some left which you can buy only at the tasting room. I highly recommend you get your hands on this wine. It is very nice. As you can see they have a nice range of wine and also price range!! What I appreciated about visiting Spier is that I learnt there is so much more to this estate than just the wine. There were tiles hanging on one of the walls in the tasting room each with a different piece of art. 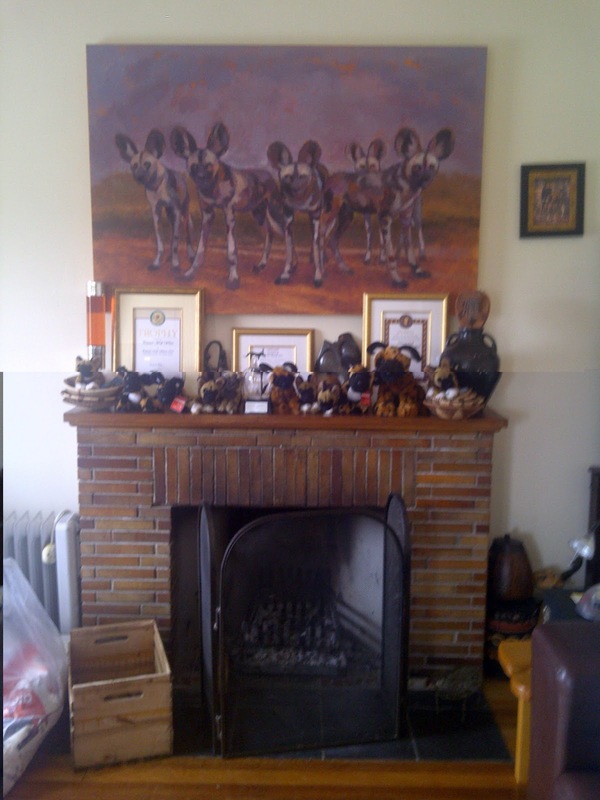 They have an art project called the Spier Arts Academy to support upcoming SA artists. 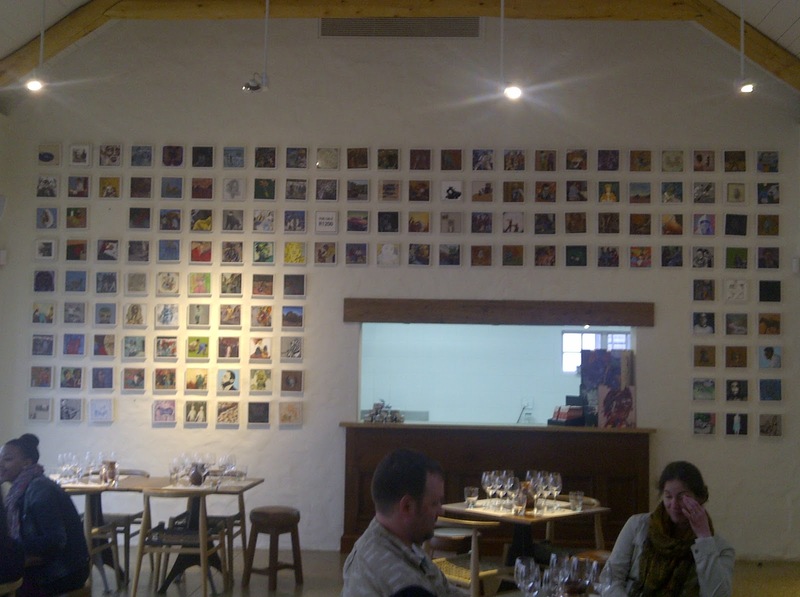 They sell the tiles in the tasting room for R1200 each to support the artists. The Creative Block wine was named after this Art project. 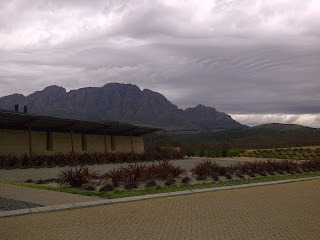 There is a 4 star hotel on the estate, a restaurant called Eight and a deli which serves picnics called Eight To Go. This wine estate practises sustainable farming and they have gone one step further by rearing their own sheep and chickens. In the restaurant they serve the eggs, chicken and lamb from the farm. Apparently they try to use natural and organic ingredients from their farm or from nearby farms whenever possible. I like this farm to fork approach they apply here. 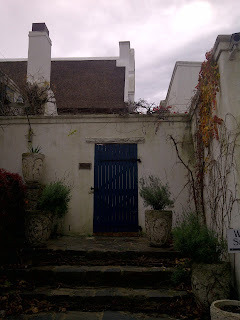 I visited this estate on two other occasions in the past two years. Once was to do a tasting but it was closed, so instead we went to the bird sanctuary and got to hold owls, that was awesome!! The other occasion was for a friends birthday. We had dinner at Moyo, the restaurant is on the estate, and had our meal in a tree house. This restaurant has a very cool vibe and atmosphere. 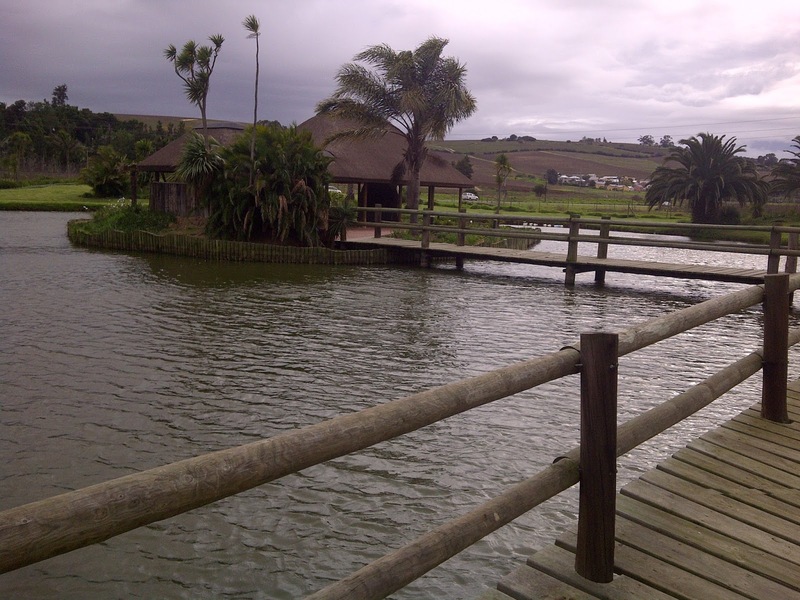 I recommend one visits Spier. There are plenty of things to do on the estate, like having a picnic, holding an owl, tasting some wine, eating at the restaurant plus much more.